Enjoy and relax with a group of trusted friends for an entertaining evening of tarot, crystals and meditation. Every evening is bespoke and tailored to the needs of you and your group of friends. Listening to their needs , I will making sure you have a relaxed and fun evening. The evenings can take place either in my spiritual room (the Cavern) or in the comfort of your own home. 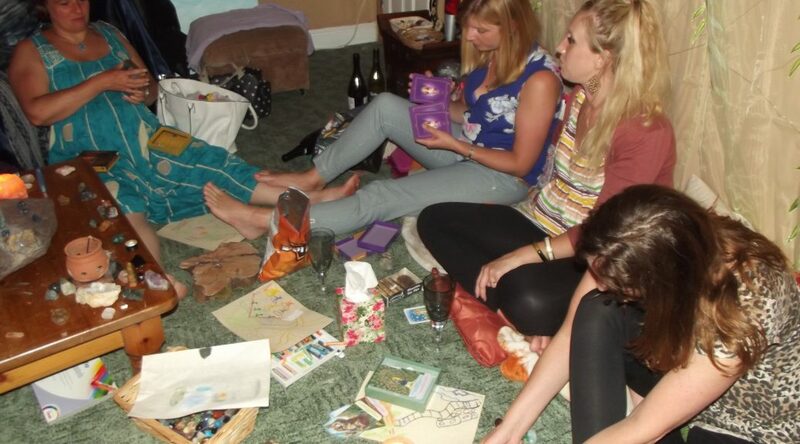 “I have attended many of Sarah’s spiritual group experiences and have had one to one sessions as well. I cannot recommend her enough! Sarah is a very welcoming, warm and insightful person who uses her gifts and tools to help guide you. Her spiritual room where she practices is like a spiritual haven from the demands of everyday life.” Heather Jenkin, Therapist and Social worker. Priced at £10* per person for an evening. If you would like a one to one session please email me for a price.